Smørstabbreen. Storebjørn to the right. Saturday; the gorgeous weather made a ski-trip the obvious choice for the day. But where? Anne was a bit skeptical to longer ski-trips due to her sudden and unexplained drops in energy level. 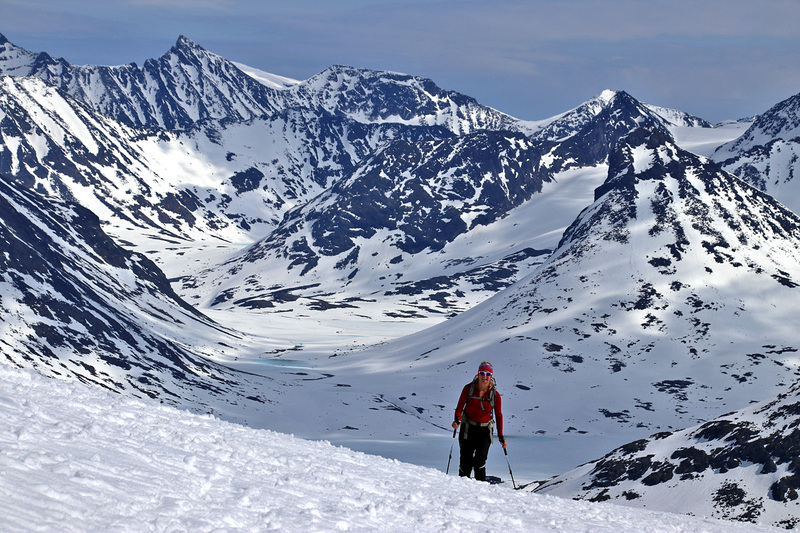 But when we discussed a ski-trip to Storebjørn, she decided to give it a try. She had been to this top many years ago and wanted to visit it again. It’s not that long drive from Sogndal to Sognefjellet and at 10:10am, we were ready to head out. There were LOTS of cars at Krossbu, but we found parking alongside the road near the tourist cabin. 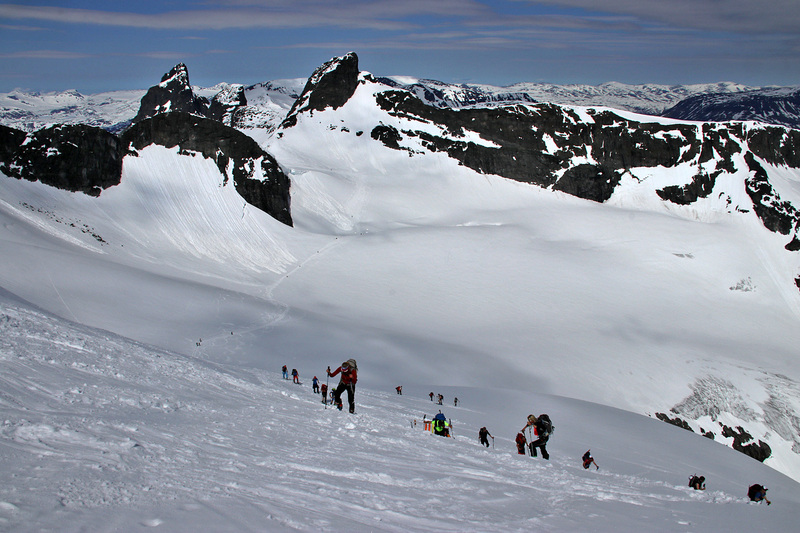 We were not sure where the main route was and followed some other skiers heading up between point 1579m and Leirhøe. 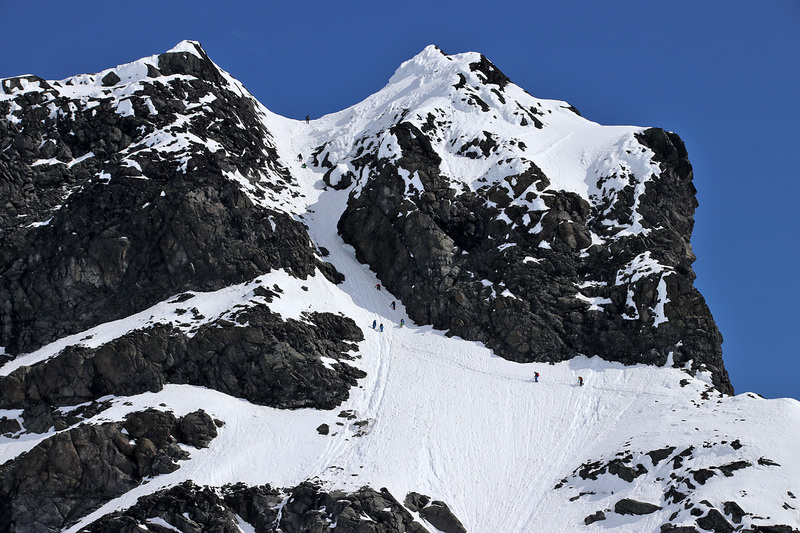 On our way up we saw that the majority of skiers went up along the river Leira and entered the glacier north of point 1668m. At least, we could head down that way. One hour after heading out, we entered the main glacier and had a spectacular view ahead of us. 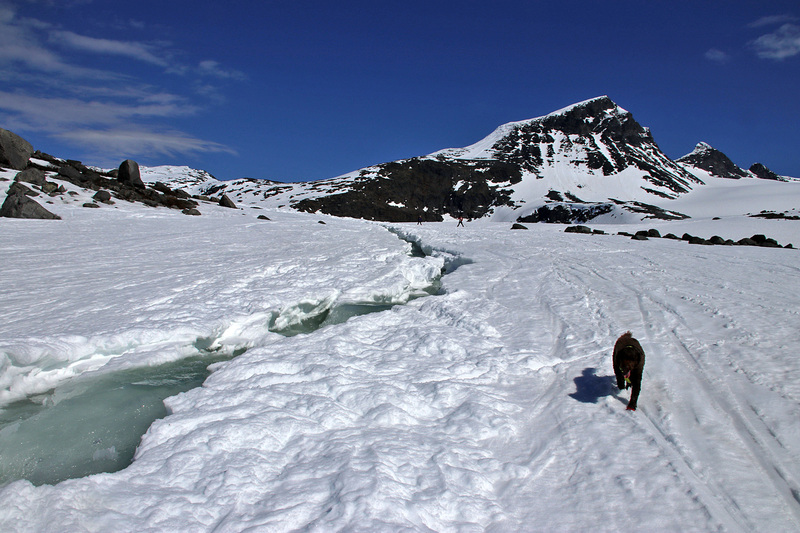 This is not a safe glacier to travel on, yet most people ski here without a rope. 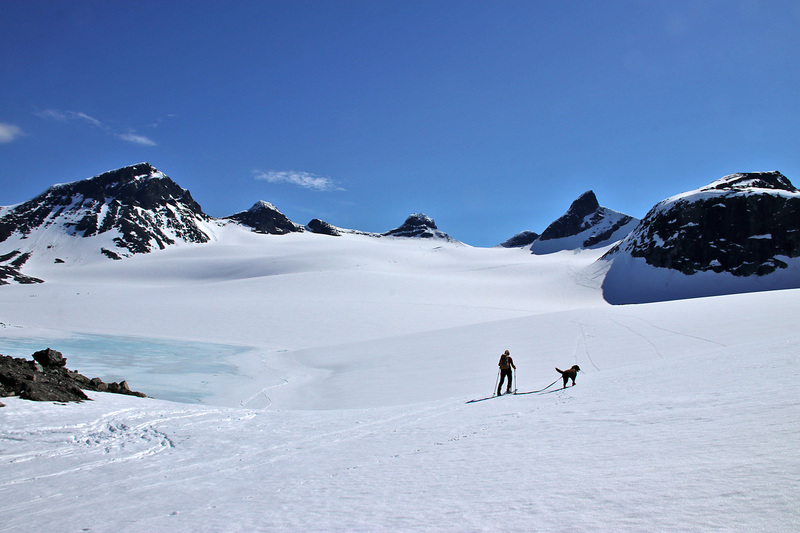 We decided to take our chances and stayed close to the Kalven – Skeie – Veslebjørn ridge. We discussed the probability of crevasses here and agreed that it should be low. 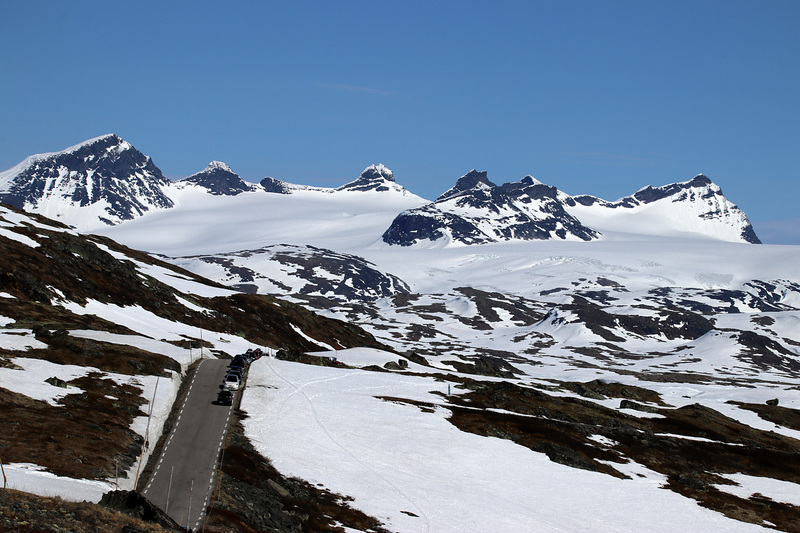 I have driven across Sognefjellet many, many times and gazed towards these rugged peaks, promising myself to visit at least one of them one sunny day. And that day was today! I was super-happy, mostly because both Anne and Karma were doing just fine. 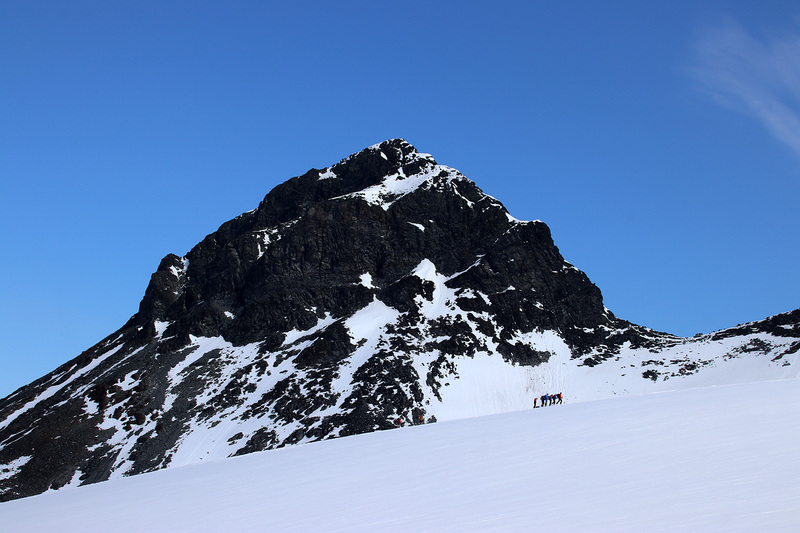 As we approached Sokse, we could see people go up and down this pointy peak. Anne said that she could wait if I wanted to go up there. I declined her kind offer. The goal was Storebjørn and I’ll surely be back for Sokse (and other tops) some other day. 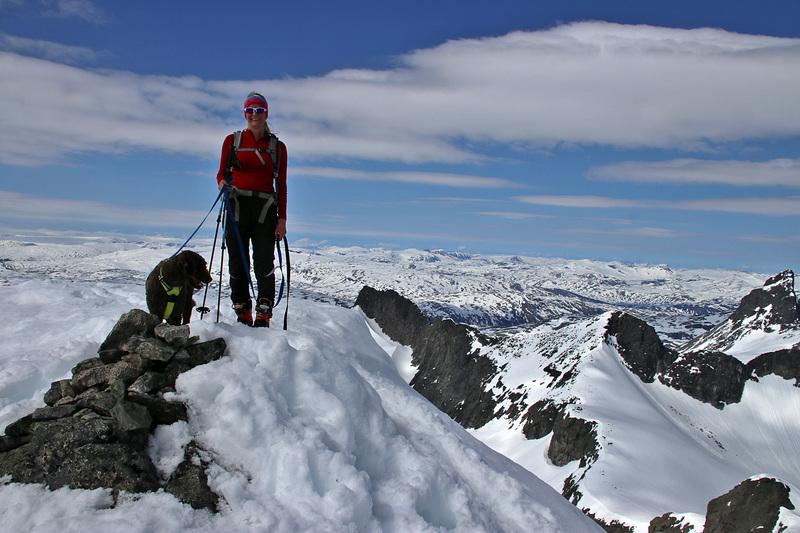 We took a break for food at Bjørnskardet pass before descending down Bjørnbrean and could look up towards the mighty Storebjørn ahead of us. The top didn’t look far away, but we knew that almost 300 vertical meters were ahead of us. Anne had a hard time up the final hill, and it was painful to watch. Normally, this kind of trip is a no-brainer for her. I really hope we can find the reason for this random drop in energy. It was clearly a hot day for Karma too, and she had to work hard in the final hill because the snow was much softer than on the main glacier. 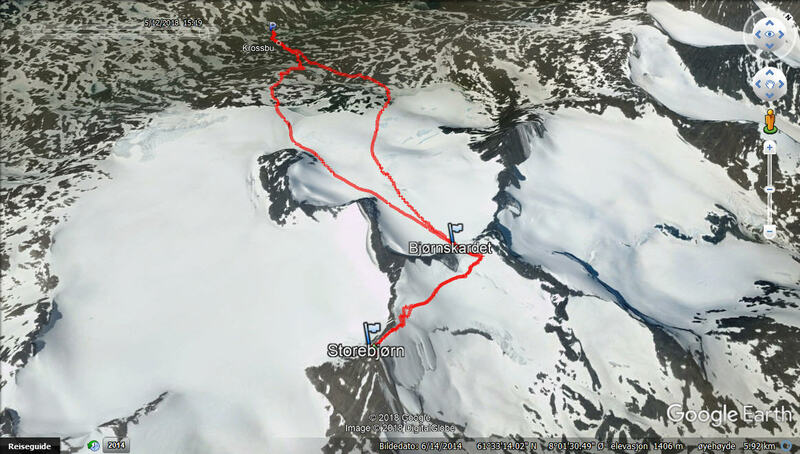 At 1:39pm, we reached the top of the highest peak on the Smørstabbreen massif. Big joy! As the summit was quite crowded, we moved to a point further west, where we could take in the views without people all around us. And the views are … stunning! 10 minutes later, we decided to head down. 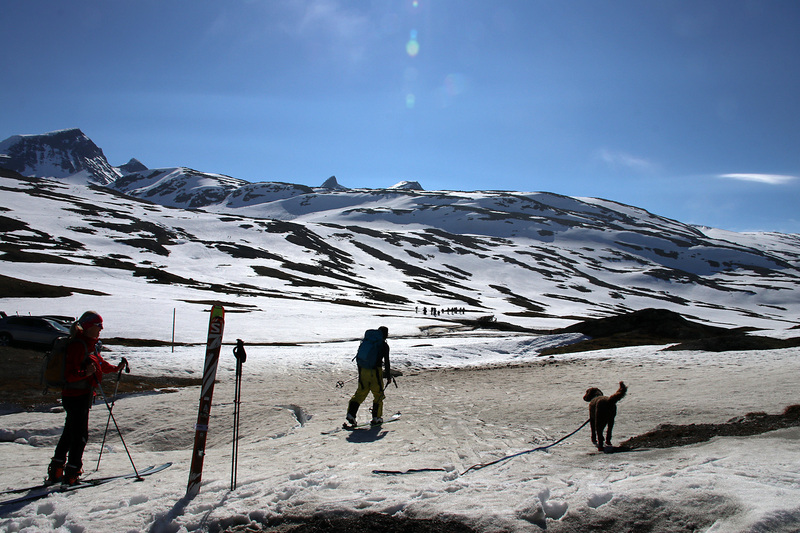 I could have skied to the top, but chose not to, as it was too steep and awkward to control the skis AND the dog (on leash). Back at the lowest point on the Bjørnbrean route, we had almost 100 vertical meters ahead of us – up to Bjørnskardet – and the only thing on our mind was the 7km (!) descent back to Krossbu. 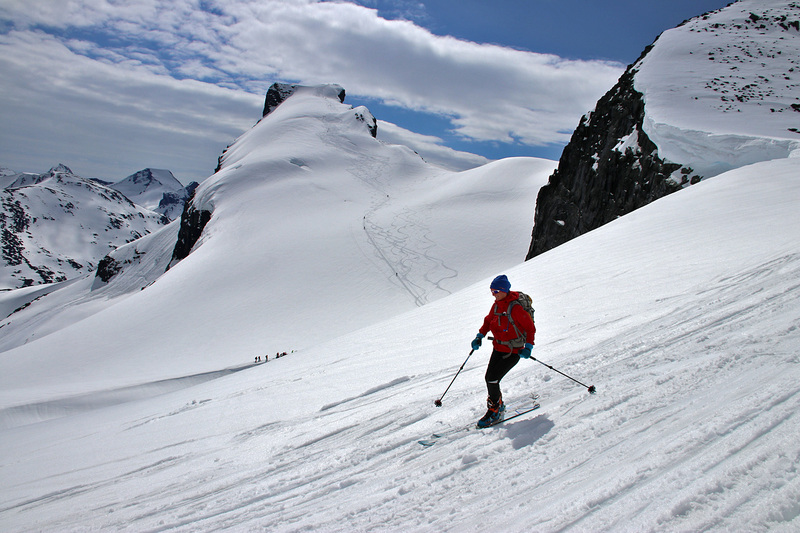 Skiing down Leirbrean was one of the best ski-descents I’ve ever had. Gentle slope, smooth sailing all the way. Karma was almost able to keep up with me, but struggled when we left the glacier and moved onto softer snow. We crossed the river Leira with a feeling that in a few days from now, crossing this river could be a bit of a challenge. But today, it was OK. We had to take our skis off in one or two places before we could cruise back to Krossbu. My only thought was how much air was left in my front left tire. It was leaking heavily and on the way to Sognefjellet, I stopped twice to fill air. But it was just enough left to get us to the petrol station in Fortun. I will definitely tag this trip as epic. Not because it’s a challenging mountain top – it isn’t. But all things considered; I finally got here (after all these years), and got my small family along. 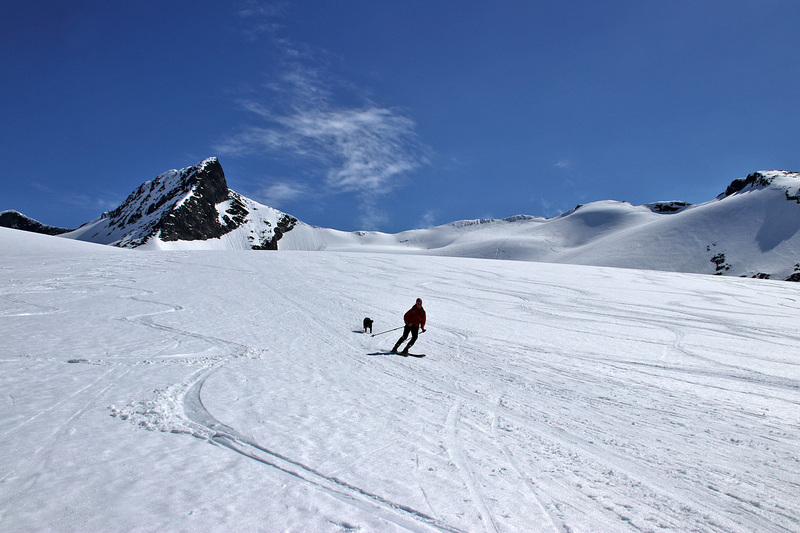 The weather was stunning and skiing down the glacier was PURE delight. Definitely a trip I will always remember. Karma has a mighty good time.